Hachigo: "We just want to be able to do what we want to do." "The issue with Honda is that matters of scale are going to weigh on ultimate profitability. It's going to be challenging, to say the least." TOKYO -- Suddenly, Honda Motor Co. looks like the odd man in Japan. Toyota just added Suzuki to its growing stable of partners, and Nissan is poised to take control of Mitsubishi. Meanwhile, Honda is left by its lonesome in the face of industry consolidation. But Honda CEO Takahiro Hachigo tells Automotive News his company is perfectly happy on its own, with its middling global sales level of 5 million units, even as rivals race toward volumes double that size. Honda will pursue technical tie-ups where they are a win-win, he said in an Oct. 12 interview. But Hachigo says the industry's craze for consolidation won't trigger any knee-jerk reactions from Honda. "We don't have any aspirations to make it 10 million," he said, referring to the global sales tallies at his top-tier competitors, Toyota Motor Corp., General Motors, Volkswagen and the Renault-Nissan Alliance, which is poised to buy a 34-per-cent stake in Mitsubishi. "We want to draw a line between those who want to do that and ourselves. We want to stay within the 5 million range," he said. "I'm not jumping at the news of other partnerships." The stakes are high for Honda, which cherishes its independence as a key to its brand DNA. Soaring costs for next-generation electrified drivetrains, autonomous driving systems and information technology are forcing automakers to team up and disperse the development burdens. Honda's own ambitions underscore the mounting pressures. Hachigo told Automotive News that by 2030, Honda expects electrified drivetrains, including hybrids, plug-ins and pure electric vehicles, to account for more than two-thirds of its U.S. sales volume. That target will require massive investment from the independent automaker. "The issue with Honda is that matters of scale are going to weigh on ultimate profitability," warns Kurt Sanger, lead Asia auto analyst at Deutsche Securities Japan. "It's going to be challenging, to say the least," Sanger said. Even giant Toyota, which plans to spend 55 per cent more than Honda on research and development this year, admits being daunted by the changing times. Last week, the world's biggest automaker said it was in talks with Suzuki Motor Corp. to hook up on technology and other spending areas. "We need to have the capability to respond to changes in order to survive," CEO Akio Toyoda said. "There is a limit to the r&d which each company is conducting individually." That proposed Toyota-Suzuki partnership isolates Honda from two growing camps. Under the tent with Toyota are Subaru, Mazda, Hino, Daihatsu, Isuzu, and now Suzuki, with combined volume above 10 million. Under the tent with rival Nissan are Renault, Daimler, Russia's AvtoVAZ, and Mitsubishi, also with combined volume exceeding 10 million. By contrast, Honda sold 4.7 million units in the fiscal year ended March 31. Hachigo conceded a Toyota-Suzuki team likely will spur some strategic rethinking at Honda, especially in Japan's cutthroat market for minicars, where Honda and Suzuki compete head-on. "I'm sure that partnership will have some impact on our mini- or small-car strategies," he said. But he remains undaunted; Honda wants to prioritize product over raw production. "We are not pursuing volume just for volume's sake," said Hachigo, who took the reins at Honda in June 2015. "By strengthening our product, that may lead to increased scale." In fiscal 2012, as Honda was approaching a global sales volume of 4 million vehicles, then-CEO Takanobu Ito set a goal of growing to 6 million vehicle sales globally in the fiscal year ending March 31, 2017 -- a remarkable five-year sales jump, had it been possible. By the time Hachigo took over, Ito and he had backtracked on that goal. Honda is hardly small. In the pantheon of global sales, it sits with Fiat Chrysler Automobiles, one rung below Ford Motor Co. and Hyundai Motor Group. Nor is Honda completely alone. It is working with General Motors to develop next-generation hydrogen fuel cell technologies for 2020. In earlier eras, Honda supplied GM with V-6 engines, conducted product exchanges with Isuzu in the 1990s and even tried partnering with Britain's Rover. Honda remains wide open to technical tie-ups, including those in new mobility fields such as autonomous driving, car-sharing and ride-hailing, Hachigo made clear. But as for capital tie-ups with other corporate entanglements, Honda still prizes its independence. "When it comes to technologies that are win-win, we want to pursue those alliances. But when it comes to business, there are things we want to do on our own," Hachigo said. "We just want to be able to do what we want to do." Indeed, aside from Toyota, Honda is the only big Japanese carmaker to never surrender an equity stake to a rival auto manufacturer. That is a history Hachigo is loath to abandon. "They are very confident of who they are," said Chris Richter, an auto analyst at CLSA Asia-Pacific Markets. "It's almost a religiouslike fervor." Honda prides itself on engineering everything from lawn mowers and snow blowers to boat motors and jet aircraft in-house. 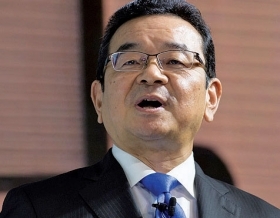 In an echo of GM CEO Mary Barra's rebuff to recent alliance overtures -- that GM was busy "merging with ourselves" -- Hachigo said there is still plenty of room to find more synergies between Honda's far-flung divisions. "We're at the point," Hachigo said, hinting at a new era of company improvements, "where we are trying to come up with some kind of internal collaboration among those product groups."